WHILE JESUS WASgrowing to manhood in the city of Nazareth, in Galilee, John, the son of Zacharias, was growing to manhood in the desert country of Judea. John spent much of his time alone in this desert country, listening to God’s voice. And when he became a man he left his lonely home in the desert and began to tell God’s words to the people. 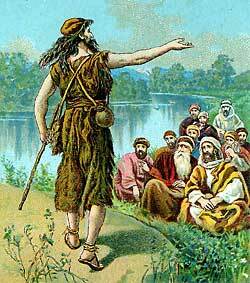 John did not go to the cities of the land to preach God’s message, but stayed in the wilderness of Judea near the River Jordan. And the people came from every part of the land to hear him speak. There had been no prophet among the Jews since the days of Malachi, more than four hundred years before, and now everybody was eager to hear this strange preacher in the wilderness tell the words that God had spoken to him. They believed he was a prophet, sent from God, and they came in great numbers to hear his words.